The DEA announced the arrests of 7 fentanyl traffickers the same day that President Donald Trump declared the opioid epidemic a 'national public health emergency'. 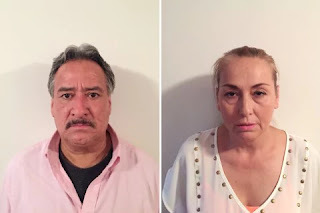 They were indicted on a total of 48 counts related to drug sales and the possession of weapons. 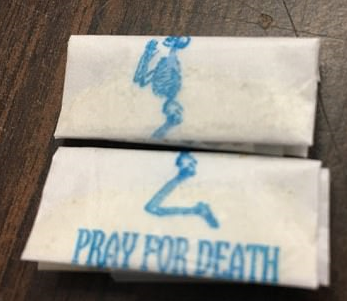 A search yielded approximately $200,000 cash and hundreds of envelopes of heroin and fentanyl stamped with an image of a kneeling skeleton and the brand name 'Pray for Death'. NYC experienced a 46% increase in overdose deaths to 1,374 in 2016. Stanely Sacarillo (right) was charged with reckless endangerment in connection with a sale that led to the overdose death of a customer. 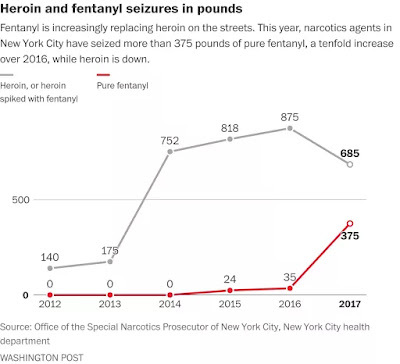 Narcotics agents have seized more than 350 pounds of pure fentanyl in New York City in 2017, 10 times as much as they did in 2016. 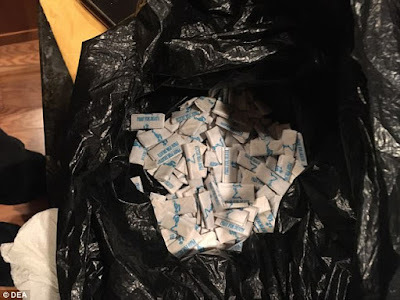 141 pounds of pure fentanyl was found in a Queens apartment in August, enough to kill 32 million people, the DEA said. It was the largest seizure of the opioid in U.S. history. “The cartels realize that fentanyl is much more profitable than heroin,” said James Hunt, head of the DEA’s New York Division. 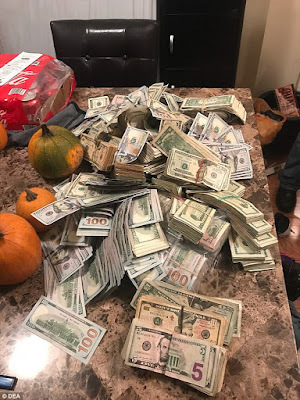 Through wiretaps authorities believe about 80 percent of the fentanyl seized in the New York area appears to be linked to Mexico’s Sinaloa cartel. The Sinaloa group doesn't bother with retail trade, according to the DEA. 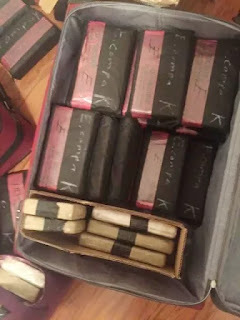 It uses New York to deliver large wholesale shipments to middlemen, typically local Dominican traffickers. Those groups distribute to markets in New England, Pennsylvania, Baltimore and other places where the opioid crisis is raging. 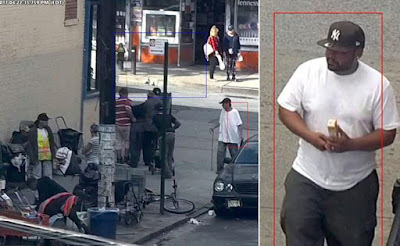 The Bronx and northern Manhattan are choice locations for traffickers for the same logistical advantages sought by any commercial distributor. Last month, narcotics agents arrested a Mexican driver in an industrial area of the Bronx with 37 pounds of fentanyl in the back of a delivery truck. The location was not far from a hotel where, in June, they seized 40 pounds of the drug stashed in a duffel bag. Although the fentanyl boom hasn’t led to more violence in New York, it has produced a staggering death toll.